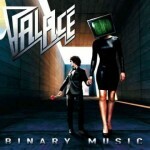 Share the post "Album review: PALACE – Binary Music"
Alongside a fast rising reputation as contributing songwriter and guitarist to a number of melodic rock releases, Michael Palace has a career of his own. 2016’s ‘Master of the Universe’ was an impressive debut but for his sophomore release, he has embarked on a change of direction nearly as drastic as his haircut in the intervening period. While the debut was firmly in the melodic hard rock mainstream, more ambitiously he brings other eighties influences into play. The title track employs some of the Trevor Horn-like dance production values of the likes of Frankie Goes to Hollywood, though the chorus is pure melodic rock and reminded me a lot of Newman. ‘Nothing Personal’ conjures a pop rock vibe from the mid-eighties generation of bands such as Device who tried to fuse AOR and dance sounds, and ‘Love Songs’ also has a poppy theme and is a good example of this being a fairly keyboard-heavy album for all Michael’s skills as a guitarist. Clearly a talented chap, supplying all instruments with the exception of drums from Daniel Flores, his vocals are impressively strong and clear throughout and the songs well structured, with ‘Tears of Gaia’ and ‘Promised Land ‘both having a slightly progressive, hi-tech vibe. Most of the songs are bright and up-tempo, though there was a dip in quality for me with ‘Queen of the Prom’ taking the pop influences too far with its barbershop-style harmonies and swing feel, only partially redeemed by a proggy guitar solo mid-song, and the ballad ‘Who’s Counting Time’. However the best is saved to last with the final two tracks, ‘Julia’ boasting a harmonica intro and a massive chorus which lodged in my brain for a good day afterwards, and ‘To Have and to Hold’ which had a total Toto vibe in the mould of his fellow countrymen Work of Art. This entry was posted in ALBUM REVIEWS, ALBUM REVIEWS (Mobile), All Posts and tagged album, Daniel Flores, melodic rock, Michael Palace, Palace, pop rock. Bookmark the permalink.